Several years ago I met a woman at a friend’s wedding reception, a woman I’ve never forgotten. During our conversation, I learned she had hiked the John Muir Trail located in the Sierra Nevada mountain range in California. The trail is about 210 miles long, beginning in Yosemite National Park and ending at Mt. Whitney, 14,496 feet. What held me was this. She’d done the hike alone. When I asked her about her decision to do a wilderness hike by herself, she thought a moment and said, “I was at a point where I needed to evaluate my life, redirect, and rebuild my confidence.” I remember feeling very inspired. I also admired her commitment. Although I’ve never done an extended hike solo, there are two hikes I’ve done I’ll always remember: Mt. Whitney and Grand Canyon. 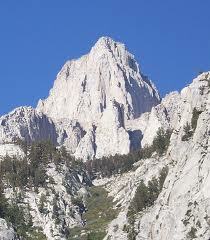 Starting at Whitney Portal, I hiked up Mt. Whitney twice over a period of several years, once with a hiking companion and once with a small group. I never saw bluer blues or breathed purer air. I heard the sounds of quiet and peace, both outside and inside my head. The stillness made room for new ideas, new thoughts, and an appreciation for the nature unfolding around me. Standing at the summit, I looked out over the unending vista and felt its majesty. 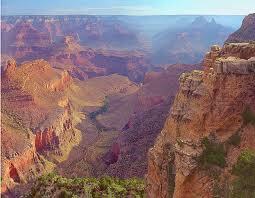 Grand Canyon, 6,000 ft. at its deepest point. As I hiked into the Grand Canyon, I descended through layers of time into a prehistoric world, with me a small spec in the passage of Earth’s history. My calves ached as we braced our way down the South Kaibab Trail. Occasionally, bats flew nearby. The image of Bright Angel Creek, its water unsullied, meeting the murky and silt-laden Colorado River is unforgettable. Truly the young meeting the old. A morning or evening walk can clear the head and keep us healthy. But a hike of a day or more seems to allow us to reach deeper inside our psyche and our souls. Inspiration needs that charge – the cleanse, the spark, the renewal, the discovery. And although I didn’t realize it, I built life-long memories that, when I call on them even today, can re-nourish me. ~John Muir, 1913, in L.M. Wolfe, ed., John Muir, John of the Mountains: The Unpublished Journals of John Muir, 1938. Have you done a hike that inspired and renewed you? Philip Ferranti has authored a number of books on hiking. I like these two: 140 Great Hikes in and around Palm Springs and Hiking! : The Ultimate Natural Prescription for Health and Wellness by Philip Ferranti, Cecilia Leyva, Joie Goodkin. This entry was posted in Books, Creativity, Finding Ideas: The Creative Process, Inspiration, Looking for Inspiration, Reading, Writing and tagged Grand Canyon, hiking, inspiration, John Muir, John Muir Trail, memories, Mt. Whitney, Philip Ferranti, psyche, renewal, soul, writing. Bookmark the permalink. Carol – So glad you stopped by. A cross-country skiing trek would have a similar effect! It’s wonderful to be in a place to move beyond the “daily stuff” and beyond yourself. To be open. To see life and yourself through another prism. Whether on a mountain or in a canyon or on a vacation. (I enjoyed your travel blog and pictures of the town and pageantry.) So glad you stopped by, Pam.